This challenging 10 day tour takes you up 4 different volcanoes in Guatemala’s impressive volcano range. One hike takes you up an active volcano where you can see lava flowing, and you can even roast your own marshmallow! The second includes an overnight stay on a volcano, to see eruptions from adjacent volcano Fuego light up the sky at night, and to see an impressive sunrise from the summit the next morning. Thirdly, you’ll climb Santa Maria, which is said to have the best views in all of Guatemala. The last volcano is the mighty Tajumulco, the highest point of Central America! Here you'll watch the most memorable and rewarding sunrise of your life. 4 volcanoes in 10 days means enough time to catch your breath, but also means you’ll have achieved something to be proud of the rest of your life! Day 1: You’ll be picked up at the airport by a collective shuttle that drops you off at your hotel in the colonial town of Antigua. There you’ll stay 2 nights in a single room, breakfast included. Day 2: An early morning driver will pick you up at your hotel to take you to volcano Pacaya with a small group and a guide. You can roast a marshmallow above flowing lava! An entrance fee of Q50/$6 is not included. At the end of the hike, you’ll be taken back to your hotel. The rest of the afternoon is free to relax, or to explore beautiful Antigua. Day 3: In the morning, you’ll be picked up at your hotel by a collective shuttle, that will take you to the Soledad Community, from where a guided hike up volcano Acatenango will depart. In the afternoon you’ll set up camp, and when it’s dark you can see adjacent volcano Fuego erupt! 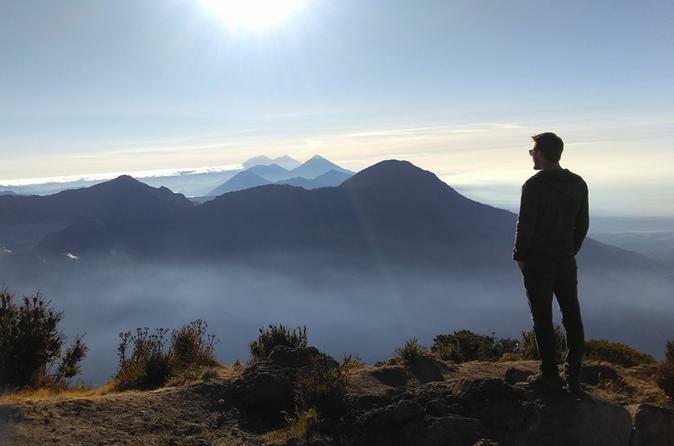 Day 4: You’ll pack up camp to head for Acatenango’s Summit, from where you’ll watch the sunrise. This hike includes lunch, dinner, guide, entrance fees, wáter, camping gear and breakfast the next morning. You’ll return to the same hotel in Antigua at the end of the hike, where you’ll stay 1 more night. Day 5: In the morning, you can explore Antigua. At 14:00, a collective shuttle will pick you up to head for Quetzaltenango where you will stay in a private room, breakfast included. In the evening you can explore Quetzaltenango, where women still wear the traditional Mayan clothes! Day 6: You’ll be picked up at your hotel early, to start a guided hike up volcano Santa Maria. At the summit, Santa Maria will present you with the best views in all of Guatemala! You’ll be brought back to your hotel after the hike, after which the rest of the day is free. Day 7: Another early pick up, but this time to head for the mighty Tajumulco, the highest point of Central America! In the afternoon, you’ll set up camp and will be spoiled with impressive views of the lit up city of San Marcos below. Day 8: The hike continues early in the morning, you’ll pack up camp in darkness to head for the summit, from where you’ll be able to witness another, even more impressive, sunrise. At the end of the hike you’ll be taken back to Quetzaltenango. The hike includes lunch, dinner, guide, entrance fees, camping gear, wáter, and breakfast the next morning. Now relax! Hiking is over! You can be proud! Day 9: The morning is free. At 14:30, you’ll be picked up at your hotel by a private taxi, that will take you to the terminal from where your first class bus leaves for Guatemala city. There you will be taken to a hostel where you’ll have a private room, breakfast included. Day 10: The hostel personnel will take you to the airport. Once you boarded your flight back home, you might want to close your eyes and reminisce about your unforgettable achievement!